About two months ago I had a hankering for a personal 3d printer- one that I could fix and break at home, instead of just fixing the ones at work. Like many engineers, I was unable to decide on buying an off the shelf, already functional printer- no instead I decided to buy a delta printer- specifically the cheapest one I could find, the FolgerTech Kossel. No, you cant have the link. If you want to buy one too, you will have to figure out how yourself- if you can’t do that, it is unlikely that you will finish the kit. Read on to find out why. See my summary at the end if you don’t want to read the long form post. NB: at the time of posting this, the kit has been changed a little bit, but I expect the quality and service are about the same. The general unboxing experience was pretty awesome. It is hard not to be excited when you get something like a 3d printer in the mail. Smaller items were sealed in little bubble mailers with labels on them, while larger items like the rails and the extrusion were taped together with “kaptan tape”. One extremely annoying and totally frustrating thing was that the screws were all mixed together. 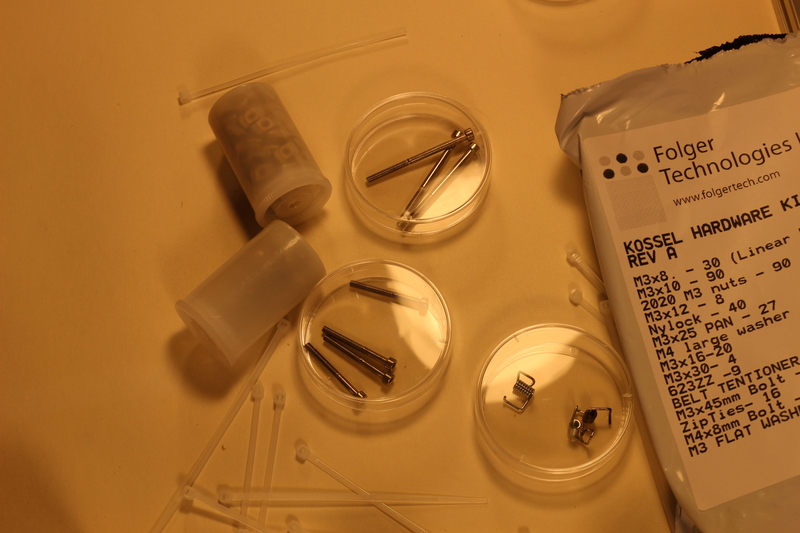 It seems like it would have been easy to separate out the ~10 types of screws into different bags, and in fact, it seems like folgertech took all the separate parts and then mixed them together, making it worse for the person who has to assemble it. Boo. Fortunately, I had enough film canisters and petri dishes laying around to sort each fastener, bearing, and washer into a separate bin. Hooray! -Despite the massive 14 AWG (.064″) cables for running the high current DC to the heated bed, the AC power cord is maybe 30 AWG (.010″) stranded, and it heats up noticeably when turning on the printer. I worried that when I ziptied it to the frame, I would pinch off the flow of electrons. It is also not IEC color coded, which means right now, it is possible that my machine is grounded on the wrong side of the fuse. Assembly was not difficult, aside from the poor print quality, shoddy instructions and missing pieces. 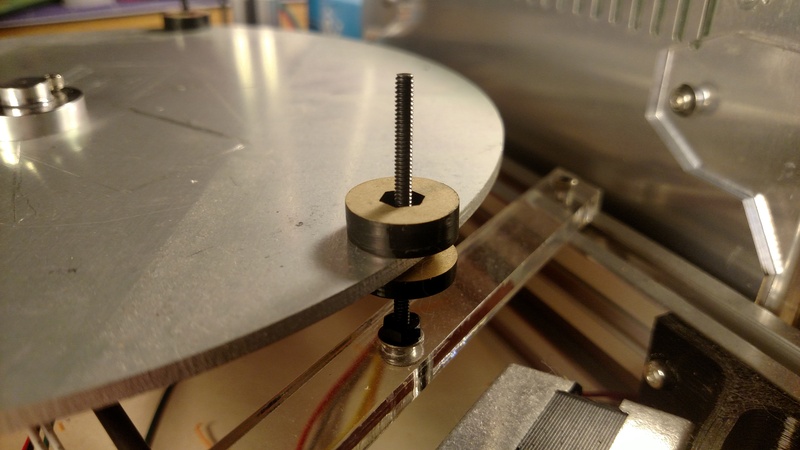 According to the kossel BOM, you need about 100 m8x3mm screws to complete the printer. I was shipped 36. After complaining, I was shipped another 36. While I was impressed that they shipped me the screws, I was not impressed by the fact that I was still 28 screws short of the full 100. Fortunately I had already ordered backup screws from McMaster Carr. This took about four days, since it was over a weekend. I could have easily built the printer over that time, but I was $4 short in screws. The print quality of the components is also quite low. The infill is decent, but it seems like their extruder had some difficulty keeping up. As a result, the prints are extremely vulnerable to de-laminating. This complication is compounded by the prints not being properly sized to fit the extrusion through them- this means that as you push in the extrusion, it is trying to tear apart the print. Fortunately, I got mine together with only slight damage, which should allow me to print new brackets at a later date. 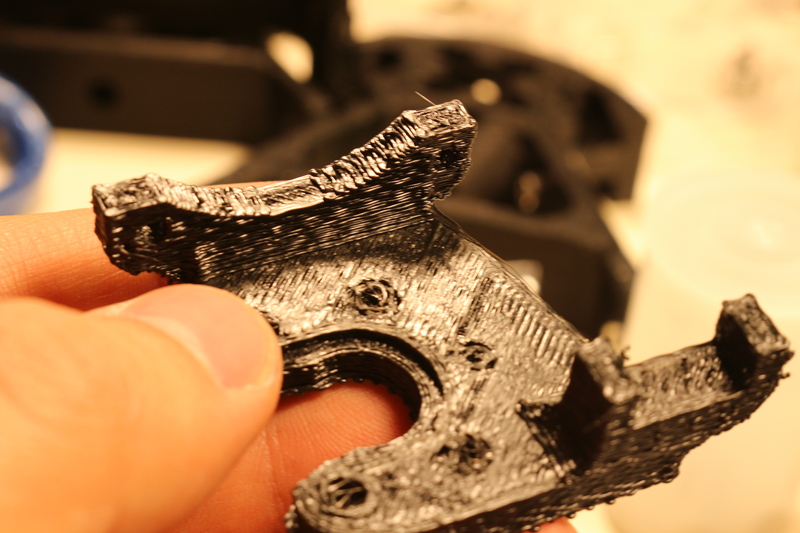 Print quality issues also caused some problems in holding nuts, which screws were supposed to thread into. Coincidentally, all of the holes that should have been clearance holes actually being interference fits for the screws, so I could screw them in with no nuts. A few of the parts (the end effector parts) I had to re print, as the parts I received were unusable. Now that we have covered the problems with low quality and missing parts, we can talk about the instructions, which for the most part are usable. They are not well lit, high quality, or in focus, but they are usable. What was totally unusable was that the instructions conflict and were apparently not shot on the same model of machine. There are extra stepper drivers, wires, and connectors that are not wired in the printer, but do show up in the pictures. To add to that, the limit switches are shown wired in such a way that when the switch is not closed, it shorts 12V to what seems to be the arduino ground, which is not the greatest thing to do for many reasons. As a note, this makes the arudino drop off the USB, so if you see that check your endstops. This would result in the bed temp going up to 105, and then the hot end temp would go up to about 100, then crash. Slowly, the bed temp would go down after that, until they were both at 25C (my room temperature). It seemed like an electrical problem, so I checked the power out of the power supply, which was good. Next, I checked the temperature of the board. Surprisingly, they were very very hot. At this point, the MSTBA connector started to make smells, smoke and melt, which led to me unplugging the printer. The problem was that the polyfuses had blown, and some combination of the polyfuses heating, the FETs heating, and living under the heated bed had caused the plastic of the connector to heat up and short the 30A 12V supply. In retrospect, it was probably that the board was mounted with metal screws (as per the instructions). The RAMPS wiki page says “DON’T secure Arduino/RAMPS with conductive screws through both mounting holes. The screw may cut into the positive trace creating a HIGH current short.”. Either way, this was not good, and totally the fault of the instructions that folgertech provided. Using non-conductive nylon fasteners might be one way to fix this. I disconnected all the electronics and moved the controller out from what was essentially a 110C oven. I oriented the heat sinks and polyfuses facing up (as they should be) in open air, instead of in an oven. With the connectors extended, the terminal block plug connector removed and with wires soldered in place, I powered the printer on and much to my surprise…it printed! Considering that the printer is held together with zip ties and given the generally low quality feel that I had as I put it together, my expectations for this printer were low. However, I have to say that it has performed admirably so far. It is extremely quick, and with a 1″ calibration cube (printed in the center) I measured that it was within about .005″ (that’s 120 microns for you metric people). This is without bed leveling, or really properly tensioned belts or anything, so I am pretty pleased. NB: after further prints this turned out to be a fluke, the Z of this print was pretty far off. 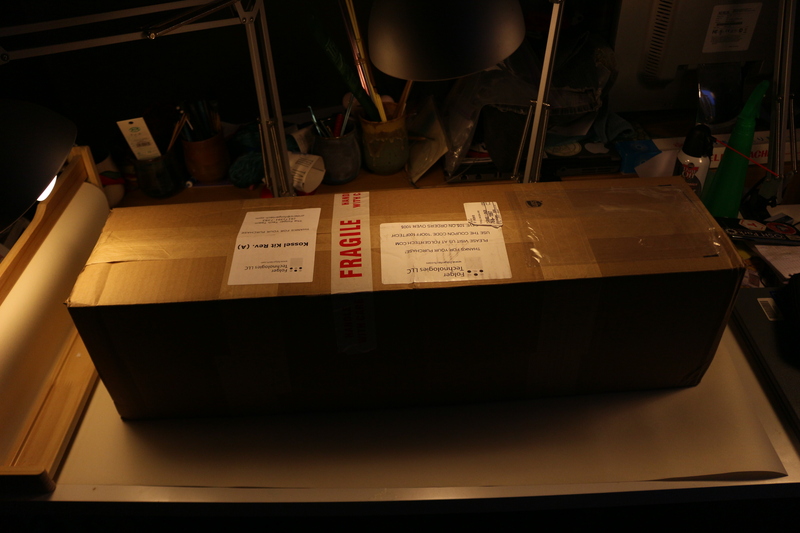 Count this as more of a box of parts, some of which you may be able to put into a usable printer. The cost of the kit is about $350, but expect to need to spend another $50-100 on parts that you didn’t expect to need, but that you will need (and that will slow down your build). Too far away from the light, and the action! …Because why not? A lot of people have done it, but what I really wanted was a way to clamp my gopro to the table of the machine- that way I could watch the part form up close, or even choose my angle. I decided the way to do this was to use the T nuts from the hold down sets we have in the shop. A T nut and a flange nut hold a 1/2″-13 stud to the bed, and then the gopro mount threads onto the top of the stud. Since it was easier to just throw it on the bridgeport and make it the “right shape”, I decided to avoid the CNC. After the fact, I modeled it in onshape, and made a drawing to try out their drawing tool. While I like their modeling tool, the drawing tool seems like it could use some work- it was really slow for some unknown reason, and I really miss the smart dimension tool from solidworks. Here is the finished mount on the table of the bridgeport. I hope I get to try it out sometime soon! Maybe it will capture some cool footage, or maybe it will get thrown back in the scrap bin. Who knows? Here is the drawing in case anyone wants to make one. To test the accuracy of Z height, which should be the “easiest” thing for a kossel to exceed at, I put the gauge under the head at x0 y0 and probed it in Z with my M430 command, which lets me know if the head is touching a grounded part of the machine or not. Since the conductive gauge is on a conductive build plate, I can tell if I am touching it or not. After doing a few tests, it seemed like the .01 mm movement had too much hysteresis to be trusted, meaning that my resolution was .1 mm (.0039″). After several trials, the average value difference between contact on the top and bottom was 4.03 mm, which is pretty dead on- which impressed me. The bed probing in action! My Kossel, which I have jokingly named “Screw Loose”, left a lot to be desired when I built it. One of the major problems I had was print adhesion- or lack thereof. Even with a heated build plate and kapton, the printer had trouble with peeling and plain not sticking to the bed. I learned what the problem was with a simple test- I went to z0 x0 y0 and moved the head around. On one side of the bed, the head touched the plate. On the other side, it moved away from the plate. After some searching (circa late 2015), I discovered that there were no RAMPS compatible firmwares that had bed tilt compensation for the Kossel, even though . I am not sure why, and I think since then this has been rectified in a fork of the marlin firmware. Instead of trying to have the printer compensate based on readings, I decided to take the mechanical approach of actually making the bed flat to the plane of motion of the head. The first thing that had to be changed was how the bed was mounted to the frame of the printer- as it was designed, it just bolted straight on with no adjustment, which was a bad decision because it almost guarantees that the build surface will be at an angle. Bed adjuster, with thumb screws above and below the bed. Making the bed adjustable was actually pretty easy. I put a long, steel 4-40 screw through the original mounting points, and fixed it to the frame with a nut, creating a “stud”. Using what I had on hand, I made some thumbscrews by laser cutting acrylic and putting it around hex nuts. This let me easily adjust the bed up and down at the three points it attaches to the frame. The next step was to set up conductive probing. I know people have gotten good results with the servo+microswitch, but I after using a renishaw probing system I just cant deal with how floppy it looks, nevermind the extra wire routing. Conductive probing is actually really easy- I made the mistake of thinking I would have to write some software and started writing my own M code commands, but its actually a hardware solution. I have no desire to add more wires to this rat nest. Before trying this, it is critical to make sure that the bed and head are clean, and that when they touch you actually trigger the endstop. If the endstop is not triggered, the printer will do its best to drive the print head through the bed, which will leave a dent- I know this from experience. It’s always a good idea to implement a command like my M430 command in marlin_main.cpp to make sure it is working before running g29 (bed probing). This snippet lets you know that everything is working by manually moving the head into contact with the bed, and checking to see if D18 changes from high to low. It it does not change, the the endstop is not being detected and the printer will try to destroy itself- which is bad. After this, I easily made some decent prints, since it all the layers were even, and the print head never crashed into the plastic! I highly recommend leveling the bed of your kossel if you have one. After a thorough electrical and mechanical investigation of the Flash device, I decided I would do a little more poking around to see if I could download the firmware from the device. In the end I was not successful (although there is hope), but I did manage to put my own firmware on the device quite easily. I took a multimeter to the tag-connect header to see which pins when where. It doesen’t look like the normal SWD or JTAG 10 pin connector, but I did find power, ground, SWDIO/RST, and SWDCLK. For reference, on the drawing above, the single hole of the tag connect is at the top. 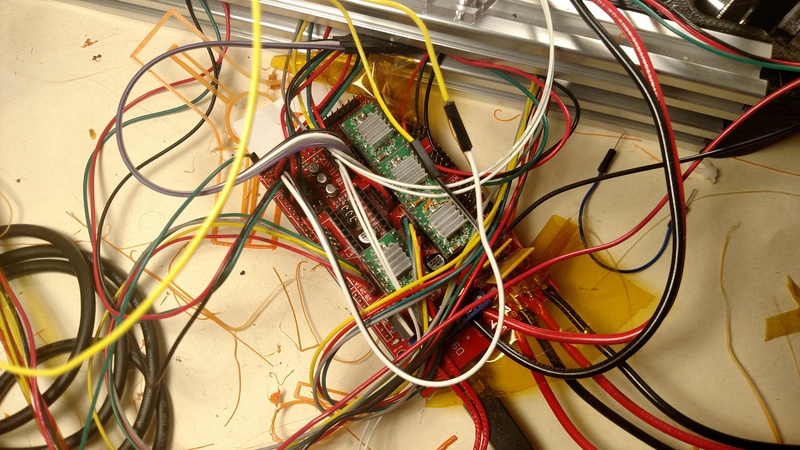 I connected a few wires to the programming pins, and then wired those pins to an STLink programmer from one of the STM discovery boards. Using OpenOCD, I first tried to download the firmware from the chip with dump image- but it came back all zeros (not shown)! This is because the NRF51822 has a read-protection feature to prevent people from gaining access to your code. This is configured through the second register in the UICR, RBPCONF. The UICR starts at 0x10001000, so I started there and read a few registers. RBPCONF was 0xffff0000, which means that all of the program memory is protected. The values in the UICR can only be cleared if the entire program memory is erased, so that’s exactly what I did- nrf51 mass_erase. With the memory wiped, reading the RBPCONF resulted in 0xFFFFFFFF, the default value of read back protection for code region 0 and all code regions being disabled. Once it was erased, I checked that I could write to the chip by putting a simple blinking LED program on the chip. 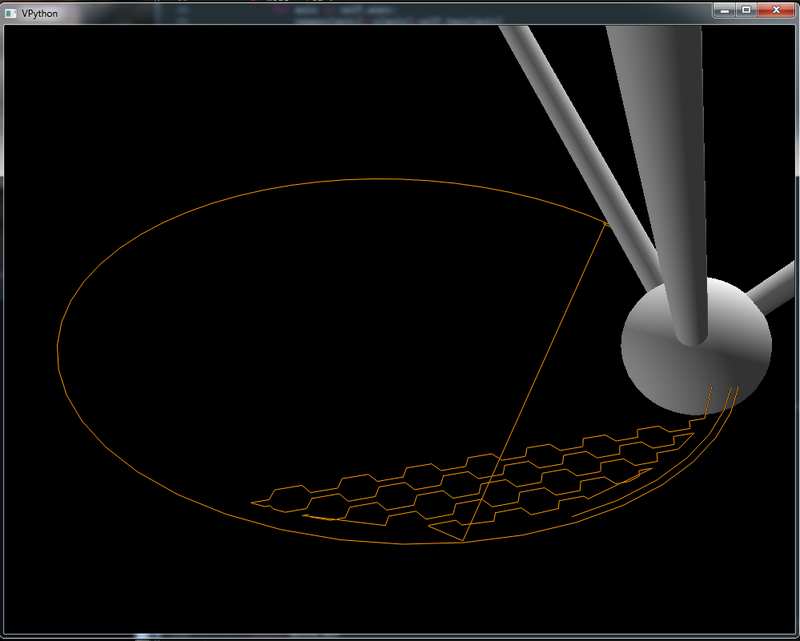 All the program does is sleep and toggle all of the IO pins, but it was enough to show me that everthing was working. Later on, I can use this program to test what pin goes to what LED, if I want to make a cool blinky display or something. After talking to my coworker about this, I learned that there is a way to dump the firmware even with the memory protection on. Since I was already on the prowl to find a non-destroyed flash to reprogram as a cool display, I might go ahead and buy one and see if I can get the firmware out of it after all. I was at an REI garage sale and found a Misfit Flash for 10 bucks. I always loved the Misfit deadfront displays, so I picked it up figuring it would be fun to take apart, especially since I work at a company that specializes in connected devices. I was surprised when I got home and realized that there is a big difference between the ultra-cool shine, and the much more economical flash. I still learned a lot and I am glad I got to dive into some hardware that did not already have several big teardowns. The engineering in the flash is as minimalist as its design. The almost featureless puck sits about 6mm high and is about 25mm across. Most of the space is taken up by a battery, which is installed by popping the bottom cover off. The bottom cover is held in by an annular snap, which is sealed against water by an o-ring that runs around its perimeter. The snap is molded with two external actions, as you can see from the flash in the groove. The material is almost without a doubt ABS. Under the battery cover is the battery, which is attached to the PCB. To prevent the PCB from falling out, a ring of plastic is heat staked to the “top” plastic which retains the PCB. This is super obvious in the rightmost photo, where you can see that the case was accidentally melted by the heat stake tool. I used a razor knife (x-acto #11) to sneak under the ring and cut out the heat stakes. This let me pop the PCB out after I removed the ring. The ring is a really small part, but it is important for holding in the PCB, locating the battery and protecting the battery clips! This leaves the flash at a grand total of three molded parts- but one is a little more complicated than the others. This is the “face” of the device, which is a translucent, soft-touch plastic (santoprene maybe?) overmolded on a thin piece of ABS. This outer layer allows the fairly bright LEDS to shine through tiny holes in the ABS, creating a crisp dot on the face of the device. In the left photo you can see thin walls of the darker soft-touch material in the light wells. This is was caused by clearance between the ABS insert and the tool that held it. The overmolding was done carefully to minimize the impact it had on the cosmetic outer surface. It looks like this edge was used for injecting the plastic, and it was carefully trimmed away later. The rest of the edge is totally smooth. Compared to something like a phone, there is not a lot going on, but that is not to say that it is not complicated. On the east side of the board, you can see the RF block and antenna. To the north, you see a couple of crystals. The west side is dominated by a QFN which is likely an accelerometer. Right in the middle, there is a button, and on the south end of the board there is a happy little sputnik. On the back side of the board, there is a battery holder, a tag-connect 10 pin header, and a nice silkscreen that says it was designed in San Fransisco, along with the initials AR and GR- maybe the initials of the people who did the layout. When in use, most of this is covered by a big sticker, but I love seeing cool little details like this. In any battery operated product, less is more. The flash uses a CR2032 coin cell, which boasts a lofty 225 mAh at 3 volts. The best AA you can buy in stores- the energizer L91- has about six times as much energy, although comparing batteries is like trying to compare apples to bread- they both have calories but they are processed in very different ways. To achieve its quoted 6 month lifespan, this means that it has a whopping 15 joules per diem to spend. That’s insanely low- to put it in perspective, that’s the same amount of energy as it takes to lift a bag of about 7 apples from the floor to the top of the fridge. Another way to put it would be 1/30,000 th of the kcalories in an apple. Anyway, the device has to be designed very carefully to use such a small amount of power. The most radical part of the power saving strategy is to actually have no voltage regulator. Many devices have started to use very efficient switching power converters to regulate power, allowing all devices to operate at the voltage they are most efficient at. However, these converters come with three major costs- money, board space, and quiescent current (power consumed when the converter is idle). The designers of this board decided to eschew converters, and just choose parts with a wide voltage range, from 1.8V-3V+. The accelerometer is most likely the LIS2DH from ST Micro. Adafruit and Sparkfun both mentioned it on their teardowns of the shine, and the package is the same. The pinout is also identical to what I saw labeled on the board (see photo) in terms of an SPI connection between the microcontroller and the chip. NB that SPI has a power savings over I2C in terms of not needing pull up resistors. The choice to use red leds on the flash is not because it looks cool or sinister, but because much like the the other major components, red LEDs will still work at low voltages. While or blue LEDs require almost 4V to work, while a nice green led would be in the range of 2.2V. Red leds have the lowest voltage drop of any color of led, at around 1.7 volts, although they are quite a bit dimmer at low voltages. This means they will operate down to about the voltage level that the accelerometer does. At the heart of the device is the beloved NRF51822. This is a frontrunner in terms of low power bluetooth, with plenty of development kits and even cheap pre-certified modules. This SoC combines a 32 bit Arm Cortex-M0 with a power sipping 2.4Ghz transceiver. This is the brain of the device. Around it, there are a couple of crystals, one at 16 Mhz and one at 32 Mhz. These allow the chip to sleep at low power for long periods of time. Also in the constellation of parts surrounding the NRF is an antenna balancing network, and a trace antenna. The Misfit Flash is a neat thing. I mean that in the fullest sense of the word- it is tidy. Everything is neatly connected, and everything has a purpose, and the effect is a simple and attractive object. I never used it for fitness tracking, but I did have a lot of fun just playing with it and watching the LEDS blink. People who are designing connected hardware would do well to study this exercise in minimalism. Delta robots are cool, so I built a kossel mini. Unlike a cartesian printer, problems with a delta printer seem a lot less intuitive to track down, and a lot harder to identify since the problems seem like they can stack/combine in strange ways. In order to see what that I ended up writing a delta robot simulator. Additionally, I wanted to find out what the symptoms of these problems should look like, and figure out tests to diagnose these problems so that they can be compensated (or at least tweaked). For example, on a cartesian printer there might be a problem with the X and Y axes being not perpendicular. The symptom in the print is that if you print huge L shape, the two ends of the L will not be perpendicular. 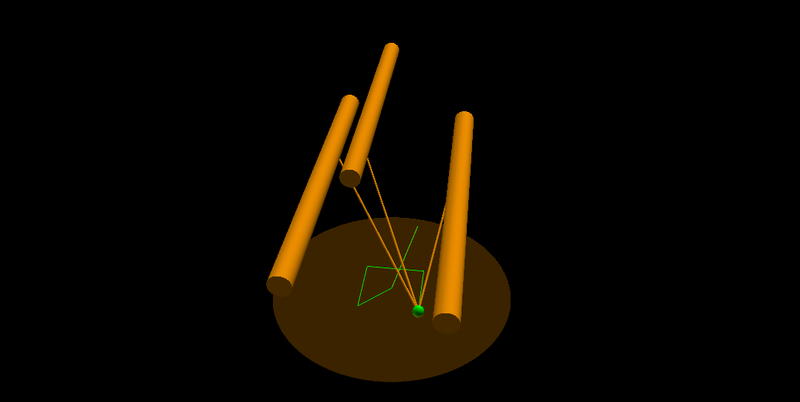 You can measure the angle and compensate in software, or adjust the two axes until the two ends of the L are perpendicular. The model works! It has been possible to simulate tool paths with some pretty arbitrary tower rotations/arm lengths thanks to the flexible way the forward and reverse kinematics are modeled. A lot of kinematic models for deltas simplify things early on in order to get simpler solutions that are easier to implement on a microprocessor, like the model on the marlin delta firmware. Since this is running on a computer, and it is meant to model things that are not perfect, I did not make those assumptions. 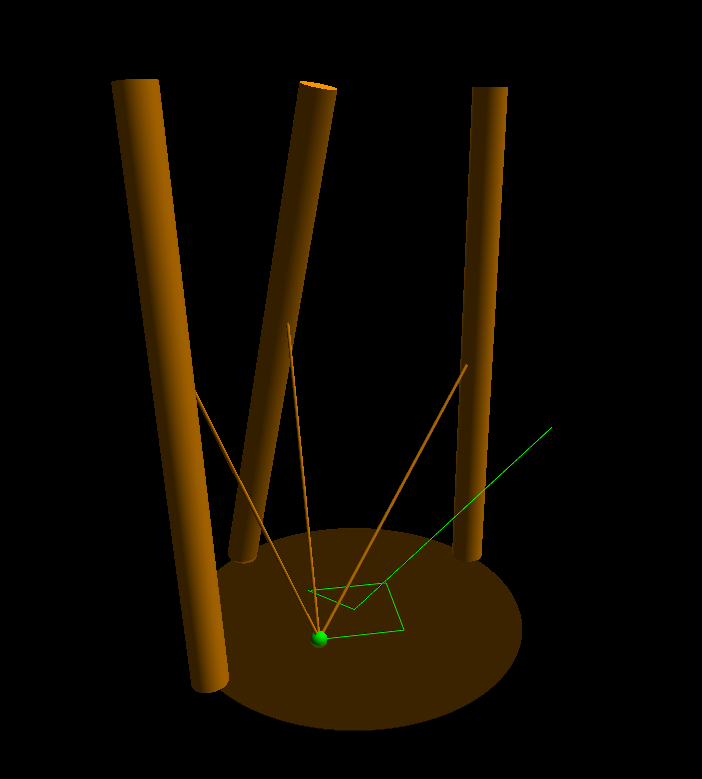 This means that I can actually generate tower positions for really weird geometries, and this model can create “tower codes” that could be used for machines with mis-matched arm lengths, or crooked towers. This might be a little smarter than having a tiny microcontroller generate the positions “on the fly”, but it could increase file size slightly.